As this issue starts, Kes (a Rebel Special Forces soldier) has announced his intentions to leave the Rebel Alliance so he can raise his son, Poe. His wife, Shara (a rebel pilot), feels like she would be abandoning the Alliance when the fighting seems to be no where near over. Her Captain ends up submitting her paperwork for her, though she has one last mission to fly. Luke Skywalker recruits her to fly him into an Imperial base guarding of one Emperor’s greatest treasures. It turns out to be two trees that were planted at the heart of the old Jedi Temple. Luke tells Shara that one of the trees is spoken for, but she should take the other with her. 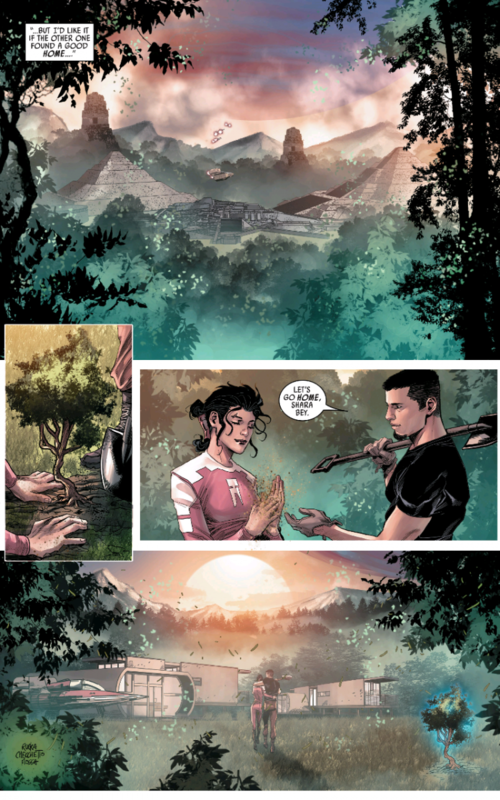 The issue ends with Shara, Poe, and Kes planting the trees and starting a new life on a faraway planet. If you have been reading my reviews of these books the last few weeks, I said over and over again that Shara and/or Kes would not be making it out of this series alive. I was very surprised to be proven wrong. As soon as Kes was about to fly her last mission, I figured that had to be game over. It was "cop on his last night before retirement" syndrome waiting to happen. Instead, everyone seems to get a happy ending here. That was a really nice touch. I also thought it was kind of cool that when Shara is trying to sneak into the Imperial Base she tries to steal the identity of Alicia Beck…who first appeared as an adversary to Han Solo and Chewbacca in Greg Rucka’s novel Smuggler’s Run. I just thought that was a nice nod to continuity. Beck was a really interesting character, and it was hinted in the book that she would play a bigger role in the future. I am curious where that will happen. The scenes with Luke and Shara were real touching. I was actually reminded of one of my favorite comics, Starman #75. In that issue, Jack Knight talks to Superman about feeling guilty about no longer wanting to be a superhero. Superman talks him through this complicated decision, just like Luke does here for Shara. Just for these scenes alone, this comic ended up being worth it. I was also very curious about Shara’s role in the bigger Star Wars picture. 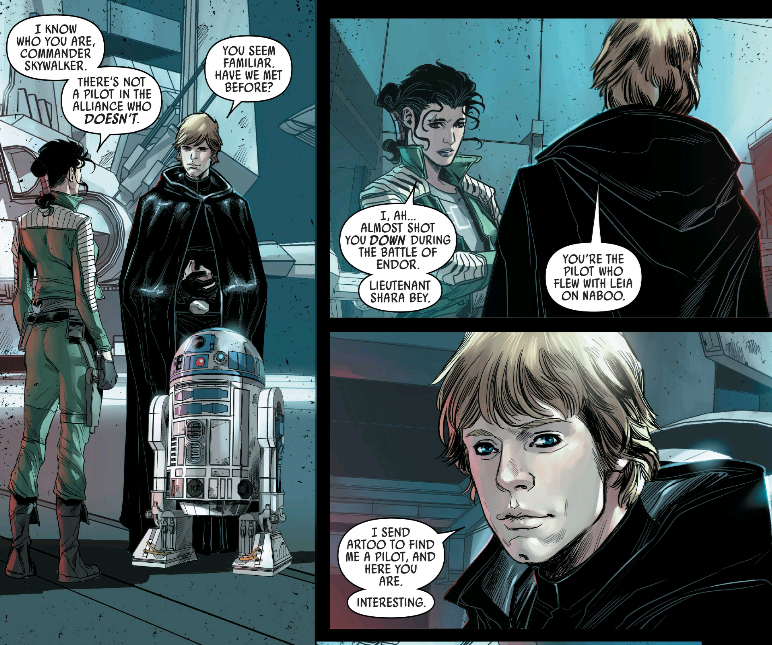 Luke finds it pretty curious that Shara keeps ending up in the “right place at the right time.” At the Battle of Endor, taking Leia to Naboo, and now helping Luke to recover stolen items from the Jedi Temple. We also know that her son Poe has a big role in The Force Awakens. Often I roll my eyes about the “fan fic” nature of a new character being suddenly so important, but I like of like the idea that the Force is operating in some way we don’t quite understand though Shara. 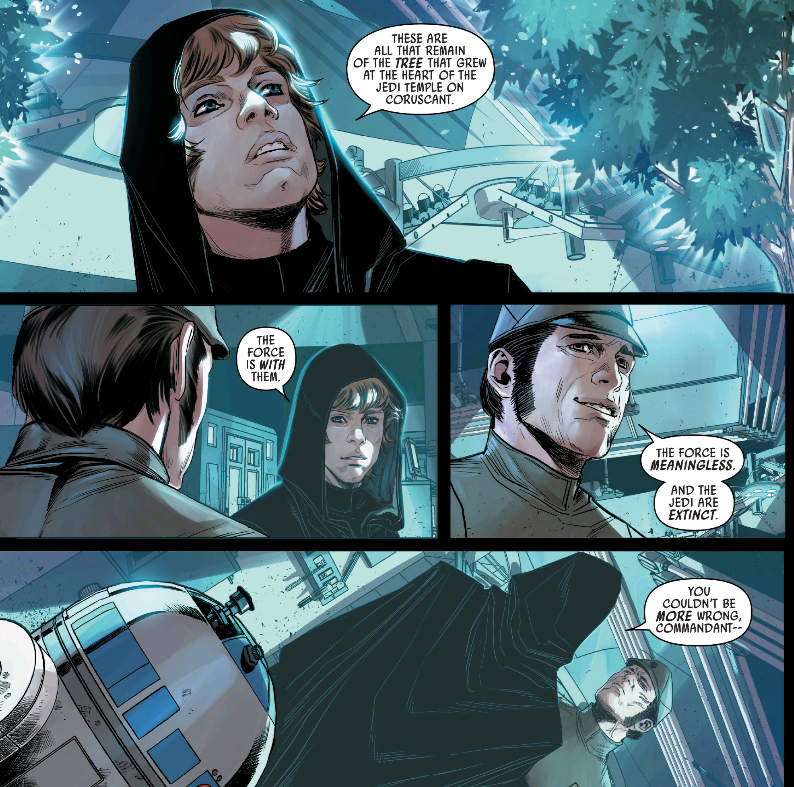 Now I really want to read a Shattered Empire sequel. Damn you, Greg Rucka! Once again, Marco Checchetto’s art was great. He draws such incredibly detailed space scenes and fighting scenes, showing the scale of this war perfectly. The Star Wars universe is supposed to be huge and full of action, and Checchetto does a brilliant job bringing it all together in an impressive fashion. I have been a little critical of Shattered Empire, but I will admit they managed to bring everything together very well. In the end, this was a real good way to tell the story of the aftermath of Return of the Jedi. Granted, we’re still no closer to understanding what leads to the First Order, The Resistance, and The FORCE AWAKENS, but that doesn’t change the fact this was an entertaining series with some real strong new characters. Definitely come to a very strong finish. Is it worth your $3.99? Yes. I kept waiting for something bad to happen here, but the story managed to keep things fairly upbeat. That really was a nice surprise. There are a lot of things teased here that I want to see fleshed out in later books or comics.